The selection of fresh veggies isn’t always great during the colder months where I live. It’s a very small town and hard to get good produce in the winter. Of course, with cooler weather, my longing for soup tends to increase. Just in case the weather decides to confine me to my home before I get a chance to peruse the sparse collection of vegetables at the store, I always have a jar of dehydrated veggies in the pantry for a kettle of warm soup. Dried vegetables last for a very long time, which makes them an excellent staple to have in your stockpile. Here are some tips and tricks for making sure you get the most from your dried veggies. If I don’t make my own dehydrated vegetable mix, then I’ll buy a bag full from the bulk food store in the next town over. I generally purchase a large quantity in plastic bag, but transfer the mix to a gallon-sized glass jar when I get home. The veggies don’t take on a funky flavor when stored in glass. I’ve found they have a strange aftertaste when they spend too long in a plastic bag. Moisture has a tendency to make it’s way into containers, no matter how secure you think they are. To make sure my dried vegetables stay as moisture-free as possible, I place a homemade sachet filled with rice in the glass jar with the veggies. The rice draws out any moisture that might make it’s way into the veggie mix. If you’re worried about bugs, you can always toss in a couple of whole bay leaves on top of the mix inside the jar. Leaving the leaves whole make it easy to remove them when you need to scoop out some vegetables for a recipe. I’m always amazed at how different spices can drastically change the flavor of any combination of vegetables. For instance, if you enjoy Indian food, add some ginger, tumeric, and cumin to your veggies. If a southwestern flavor is more to your liking, then you could try a mix of garlic, onion powder, red pepper sauce, and cilantro. My favorite soup includes using chicken broth, thyme, basil, and some black pepper with my vegetable mix. Experiment and see what your taste buds like best! I find the fastest way to rehydrate my dried veggies are by pouring boiling water over the top of them. Place the desired amount of dehydrated vegetables in a bowl and cover with almost twice as much boiling water. You can always drain off any excess water, if your recipe doesn’t call for any, or simply dump the veggies and water into a pot for soup. I often don’t bother with rehydrating veggies first if I’m going to throw them into a soup or stew. Be sure to keep an eye on the water level though if you use veggies dry. You don’t want to be short on water for your soup and have it burn. Put 3 cups of dried veggie mix, 3 C water, 3 C chicken broth, ½ C Basmati rice, a can of diced tomatoes, 1 tsp dried basil, ¼ tsp dried thyme, ¼ tsp black pepper, a dash of salt, and some sautéed onions (to taste). If you want meat in this soup, it’s great with either chicken or beef. Cook the meat first and then add it to your pot of soup. You can even cook the meat with the onions and only have to use one skillet. Once everything is in the pot, bring it to a boil and then simmer for 20 minutes. Cooking time will also vary with the size of your veggies. The mix I use are diced into tiny pieces and consists of mostly potatoes mixed with some carrots and the occasional pea. What’s your favorite recipe using dried veggies? I love the idea of using a little packet of rice in the jar! You could also throw in an oxygen absorber or use a foodsaver jar attachment to get all of the air out. I use a foodsaver and my jars stay fresh for years. Great website, I just found you via pinterest! Using a foodsaver keeps veggie mixes dry and fresh in canning jars or 20 or more years! Get the caps that let you use the seals & rings to vacuum out all the air. The handheld Foodsaver is only $20! Thank you for the tip on adding rice. That is the most practical advice for my day to day use or camping. You can glass mason jars from just about any retail store. Alternatively, you can check out these ones which are quite good. I’m a lazy crockpot guy. 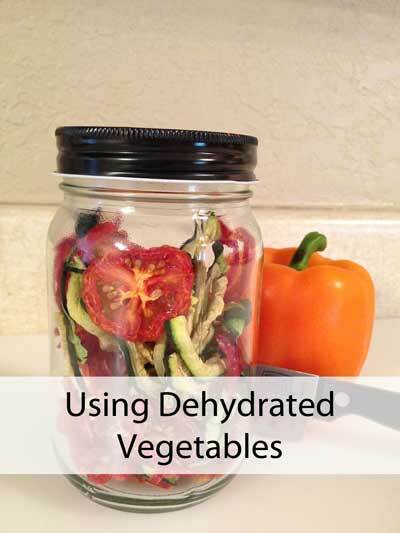 I’ve been tossing dehydrated veggies (and such) in the crock and going from there. Should I rehydrate first? Or do some just rehydrate that way? It’s a good idea to store the dry foods in a Jar.